1. My mom made this old school chocolate whipped cream frosted cake over the weekend and it was ridiculously good. Like so ridiculously good that I think it was demolished in 24 hours. 2. Question of the day: how badly can I crave this peanut butter and jelly cookie tart? 3. My ultimate mom fail so far: came home on Saturday night and realized I’d been wearing two different earrings the entire night. Both studs, but one was easily triple the size of the other. HOW?! 4. Do you have a favorite pair of headphones?? Or I should say earbuds. I’m not looking for over-the-ear headphones (I have a pair of Beats) but ones that don’t kill the insides of my ears if I wear them for 30 minutes. Maybe I just have abnormally small ears. 6. My super inspiring friend Nicole started a podcast and you can find my (what I’m sure is horrifically embarrassing) interview here! Listening to your own voice is a special kind of torture. 7. We just watched Billions last night and it’s easily becoming one of my favorite shows. Like The Affair and Homeland worthy. What did you think of this week’s episode? And Super Bowl halftime thoughts? I love Bruno Mars (like, love so much that I still often youtube his first halftime show which in my opinion, was the best EVER) and obviously love Beyonce, and really like Coldplay too… but was fairly underwhelmed? And we all know that I’m one of those people that always loves everything. Worst critic ever. I did love all the neon though. Of course. 8. Always so inspired by Tracy’s weekly meal prep. It’s so REAL and legit. 9. Are you eating anything exceptional for Fat Tuesday? I totally forgot that it was Fat Tuesday until, well, right now! What should I make?! 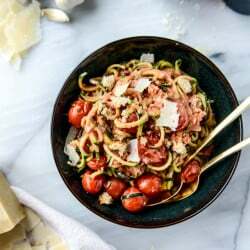 Zucchini Noodles with Cherry Tomato Garlic Cream Sauce and Breadcrumbs. they made for women and I’ve had zero issue with them…super comfy too! I love yurbuds, you can usually find them at Target for $20? They come in fun colors and they lock in your ear canal. I have small ears and they are so comfortable. I have tiny ears and yurbuds have been the only thing that are comfortable. Their customer service is also very friendly and quick if you lose/want to order extra covers. Fat Tuesday = pancakes for dinner! I’m not a mom yet but I didn’t realize I was wearing two different sneakers one day – not similar – and someone in a store asked me if it was a new trend? I didn’t realize it was Fat Tuesday!!! AHHHH I might HAVE to go to Chiptotle b/c I’m giving it up for Lent! Oh and soda…AHH, decisions!! I am also a card-carrying member of the tiny insides-of-the-ears club and bought YurBuds after reading about them on another blog. They come with two sizes of rubber covers/inserts and actually stay PUT during running, burpees, and accidentally catching the cord on a kitchen drawer knob in an attempt to rip out said earbuds. Oh and they come in super bright colors. Good luck! As I sit here in my cubicle longing for the next 6 hours to be over I was so thankful for your podcast. I may have shed a few tears and …giggled a bit- God only knows what my co-worker thinks :p Thanks for sharing this podcast and Tursday inspiration. Ha- I must totally be wishing for Thursday too ^^ ? I know you’re looking for in-ear buds but the Bose Q25 Noise Cancelling headphones are the best. I’ve tried everything beats, all kinds of ear buds for my tiny ears and they’re all painful after an hour. The Bose Q25 headphones are money -I work full time at a tech co and I wear these non-stop for 8+ hours and they’ve never hurt once. I forget that I’ve even got them on! I just bought the Bose Quiet Comfort Noise Cancelling Ear Buds. Seriously the best ever. You can turn the noise cancelling on or off, which I love and they are super comfy!! Bose all the way! I have these https://www.bose.com/en_us/products/headphones/earphones/soundsport-in-ear-headphones-audio.html#v=soundsport_ie_headphones_ii_audio_charcoal, which are audio-only (but they make versions where you can talk on them, too). Like you, I think I have really small ears, and find most earbuds sooo uncomfortable – I always wind up with a headache or majorly itchy ears. I switched to these awhile ago and haven’t looked back. They’re great for podcast or audiobook listening either short or long term, and also work very well for workouts. The best thing about Bose is the warranty and customer service. If they break in the first year, they replace them. And after that, if they die (mine typically last 3-4 years of HEAVY use), you can call and ship them back, and purchase brand new ones for about $50! I’ve ALWAYS wondered if I have really small eardrums, because so many in-ear headphones hurt me after like 20 minutes. Apple buds are the worst for this for me. I know this is going to sound a bit nuts, but these $6 ones from Amazon are awesome and don’t hurt me at all! Also, six bucks. Meaning you can replace them whenever and not feel guilty if you lose them. Oh, and they don’t fall out easily either. Yurbuds are the first ear buds that don’t hurt my ears. They are incredibly comfortable and cheap too. Adding my voice to the yurbuds chorus!! They are so comfy for us tiny eared folks and they ACTUALLY stay put during exercise. Oh, you haven’t done two different shoes yet? …….Wait, that was after my 2nd child. VINTAGE SONY MDR-W08L Ultra-Lightweight Stereo Headphones you can still buy them on E-bay and you don’t even feel them in or on your ears. The bestest! Until my 17 month old twins arrived, I had never lost a pair of sunglasses either. I then lost two really nice pair in the span of about 3 months! Definitely try the yurbuds! They’re inexpensive, and since there are different sizes of “buds”, the fit is customized. I’ve run a ton in them and even when sweaty, they stay put and you forget they’re there. I even keep a pair at the office to listen to music while I work. I literally only buy Skull Candy ear buds, they’re like $10 and the best I’ve found.. I also don’t feel as terrible having to buy another pair when my puppy destroys them! They come with different sized ear inserts (not sure if that’s the word) and I wear them at work for 8 hours at a time and have had 0 pain. I’m born and raised in New Orleans, and, as a first time mom-to-be, I’m sitting this Mardi Gras day out. I’m exhausted from parading all week, and growing a human is hard work!! If you want real Mardi Gras food for Fat Tuesday, do something quick and delicious. Poboys! Roast beef with debris or fried shrimp & oyster are some favorites. Just please make sure it’s on a damn good loaf of French bread, and dress it right! Mayo, lettuce, pickles, tomatoes. Maybe some crystal hot sauce. Nothing else! I love these. Skull candy will also replace them if they ever stop working! And they’re only $20. I second, third and fourth the skullcandy earbuds. They work fantastically well and are the first that I have found that stay in place and do not hurt my ears at the same time. My favorite is Yurbuds! They are seriously the best earbuds I have ever had. They fit so comfortably and the wire doesn’t get all tangled. That cake looks incredible! I’ve had Urbanears earbuds for a few years now and I love them. They’re reasonably priced and they come with 3 different inserts for if your ear is smaller or larger. They have a bunch of cute colors half off now, too https://www.urbanears.com/ue_us_en/headphones/earbuds/medis. Once when I was on a walk, my iPhone slipped out of my hand and it just dangled and my earbuds didn’t move. I was so surprised! I have a pair of Koss earbuds with several different sized inserts, the smallest of which works better than any other earbuds that I’ve ever worn. I tend to have the same issue and definitely sympathize. Good luck! these headphones changed my life, they are the best for working out/running and are the only ones that dont fall out of my ears or hurt weird, plus they are $6 so you can buy them in all of the colors! Another vote for Yurbuds! I’ve used them for several years now and they’re comfortable and stay put even through races and half marathons I’ve run. I have these earbuds and I love them! I loved the half time show too! They were all great. And those lights on stage were so cool! I have crazy small ears too and the only earbuds that have ever worked for me are skullcandy–they come with 3 sizes and i always use the smallest. I have small ears (ear holes?!) too, and all earbuds kill my ears and fall out except these. These rule. Need amazing earbuds? I have a pair of Normals. They are custom 3-D printed to your ears. So they fit perfectly and only your ears! They also have amazing sound quality for music and talking on the phone. I am OBSESSED with them. They are a bit pricey, but they often offer a 50% off discount! Hi! Can I see a picture of your sunglasses or a link? I’m always looking for the perfect pair as well!! Thanks! Love your blog!!!! Just read about these earbuds yesterday! http://www.bedphones.com/products/bedphones-gen-3-sleep-headphones.html not sure if they are what you are looking for but thought I’d share! I can’t stop drooling over your mom’s cake. Yes, my favorite cake is white cake with white icing. There isn’t a recipe for one on your blog. Future post maybe? Oh man!! I totally forgot it was Fat Tuesday too!! Well good thing I posted a bunch of delicious treats on my blog today. Guess I’ll just have to pick one (or a few) of those to make today! :) Sweatpants here I come! Definitely the Bose sport earbuds! I have super small ears too and ALL earbuds I’ve tried hurt my ears except for these. Pricey but worth it. I have tiny ears too and I love the in-ear Apple headphones, not the ones that come with your iPhone but the ones with rubber covers that you often see with other earbuds. The 1-year warranty is also a lifesaver, I abuse my headphones and lost a piece within the first month I had them and they replaced them AND renewed my warranty from the date they broke! hey girl love the post!